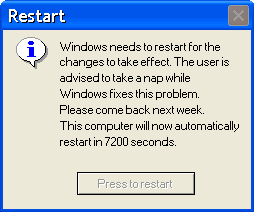 Just as a computer sometimes needs to reboot and reconfigure, project teams often need a mid-project reset. The dreaded phrase: Start over. You’ve hit a wall. Nothing seems to be going right and all hope is lost. As hard as your team tries, it just doesn’t quite pan out. Some teams panic at this stage. No one wants to have to begin again, but often, a fresh start is the most liberating and exciting thing a team can do. You’ve poured hours of time and energy into your project just to be told you’ll have to do it all again: rewrite the proposal, pitch a new idea, brainstorm and plan and organize all over. In my experience, often great ideas were missed in earlier stages, whether cast aside or never considered. A refresh is a chance for you and your team to generate new ideas and rethink old ideas to create a new and exciting plan. For me, the planning is the best part, so why not let the new brainstorm session with your team members fuel you for the coming weeks of hard work? Starting over inevitably makes the team feel as if they failed the first time around. This is far from true! Even if the team is in need of new ideas, through the first half of the project, you’ve gotten to know each other and learned each member’s strengths. You’ve figured out some of the kinks, which will make the second half of the project run much more smoothly. You’ve budgeted time for each piece of the project, so starting over feels like a huge risk and an even bigger rush. How will you fit in everything you need to get done? This is related to the last section. The second time around is always easier. The team knows better what they are doing, and since they don’t want to have to start a third time, they plan much more carefully. With new energy and enthusiasm after the reset, the team pushes forward more quickly than before with a better understanding of each other and the entire project. So, don’t be afraid to restart and refresh. It will only help the team in the end.